Valentine's Day is s holiday I feel slightly embarrassed about celebrating, as if I should be eschewing the corporate mandated chocolate frenzy in favour of a lifestyle in which I express my love for my husband all year round, in ways that don't involve buying things. The thing is though, I do show my love daily, and just because we've got an every-day-is-Valentine's-Day thing going on doesn't mean I have to boycott Valentine's Day. I just have a thing for holidays, especially holidays involving food, and if one day a year I celebrate my love in an official manner with chocolate, candle-lit dinners and other cliched ways, well, what's wrong with that? So I've come up with a compromise, a way to balance my dislike of made-up commercialized holidays with my love of special occasions: I go ahead and give my sweetheart chocolates, a fancy dinner and plenty of romance, but skip the store-bought stuff. I usually make some kind of chocolates or cookies, and this time I made an old favourite: mini mochaccinos. These are two layer chocolates with a coffee kick, very easy to make but rather impressive looking. I got the recipe ages ago, from somewhere in my mom's cookbook and magazine collection--I've long forgotten both the source and the original name (and if any of you can think of a more catchy name that "mini mochaccinos, please let me know). 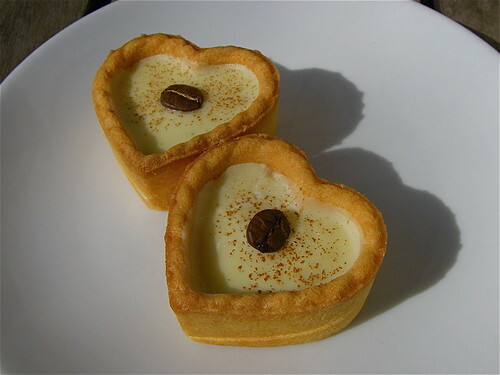 I think the recipe is pretty much unchanged, except for a bit more coffee flavour and the optional addition of the heart-shaped tart crust. Unfortunately I'm not much of a baker so these crusts were store-bought (yup, I broke my own rules), but they really make these chocolates extra special. As a bonus it also makes them a bit easier to eat, as the bottom dark chocolate layer is rather soft and tends to melt faster than the firmer white chocolate, causing sticky fingers. As you can see, the dark chocolate on the bottom, white chocolate on top and sprinkle of cinnamon makes them look a bit like cappuccinos or mochaccinos, hence the name. 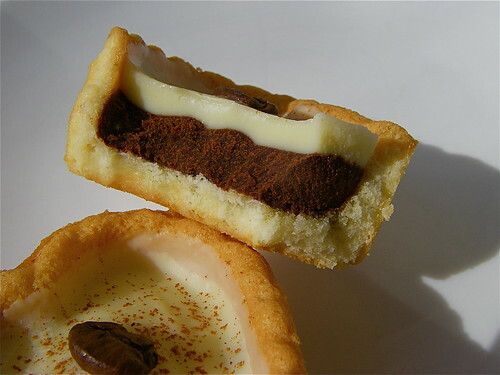 The addition of the tart shell adds another texture, and the combination of the three--the crisp tart, soft creamy chocolate and firm white chocolate--is so nice that I think I should learn how to make a basic tart crust, so I don't have to rely on the pre-made kind. 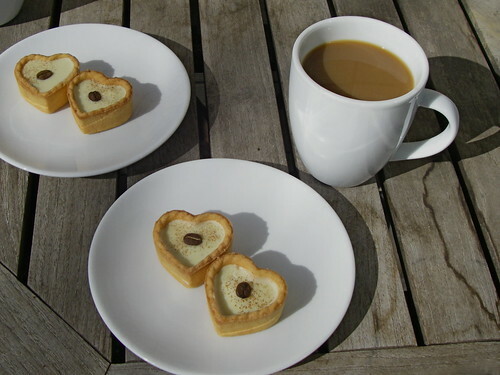 We're in the middle of a warm spell--it's supposed to get up to 20 today-- so I served the mini mochaccinos with coffee on our balcony, followed by breakfast. 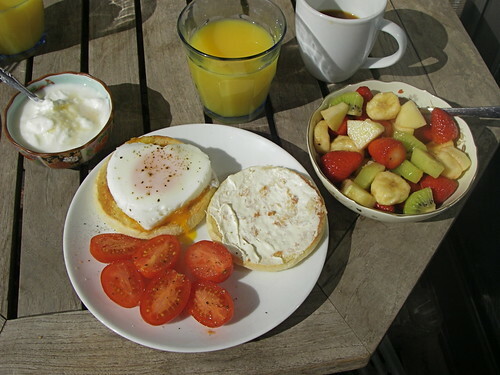 Yes, the egg is heart-shaped (done by frying the egg inside of a cookie cutter placed on a frying pan), but I did resist the urge to carve the tomatoes and strawberries into hearts. I'm not that bad. It was such a treat to eat in the sun, and I know it will get cold again but it feels like spring has arrived. Perfect weather for falling in love again. In a double boiler or a bowl over a saucepan of hot water, melt the bittersweet chocolate with the cream, stirring often. In a separate bowl, dissolve the espresso powder in the vanilla, then stir into the chocolate. Pour the melted chocolate into the candy cups or tart crusts, filling halfway, refrigerate 20 minutes or until firm. While the chocolates are cooling, clean and thoroughly dry the pot or bowl that was used to melt the chocolate. Use it to melt the white chocolate, making sure not to splash any water in the bowl: even a drop of water or other liquid will cause the chocolate to seize. When the white chocolate is melted, poor over the firmed chocolate in a slightly thinner layer. While the white chocolate is still soft, sprinkle each mini mochaccino with cinnamon (for an extra-fine dusting put the cinnamon in a fine tea strainer, shaking gently to sprinkle), and top with a single coffee bean in the middle. Refrigerate until firm. Hi Amy! How lucky is H?! Those mocachinnos look fantastic, as does the entire breakfast. I'm making (almost) roast lamb tonight for D; our local supa has expanded it's lamb cuts section thank goodness. Happy Valentine's Day :) And thanks for the recipe! P.S. Aiko made me a cheesecake with strawberry jam topping. Wondering if you can give me some tips how to take those beautiful pictures of yours. What kind of setting do you have for your camera? Do you usually have it autofocus? Or do you adjust the settings manually? I really like your high clarity, high sharpness, high contrast and high resolution pictures. And I just want to learn from you how you do it. Thanks. Thanks all, and Happy Valentine's Day! Mrs J, Sounds delicious. One of my local supermarkets has decreased its lamb offerings, another stopped selling it completely. Wish I could trade neighborhoods! Frances, I just have a regular digital camera, almost always set to autofocus. It's a Pentax Optio W30, and I know Pentax is not terribly popular but I think they make the best cameras an amateur can buy. These particular pictures turned out nicely because they were taken outside in the morning sunlight.